Wow! Today’s trip was just awesome. We headed south for a change (we had been making our way north to Jeffrey’s Ledge most days for the last two weeks), and we spotted two blows- one was noticeably taller than the other. We moved a little closer and began watching a mom and calf humpback pair- Milkweed and her calf. 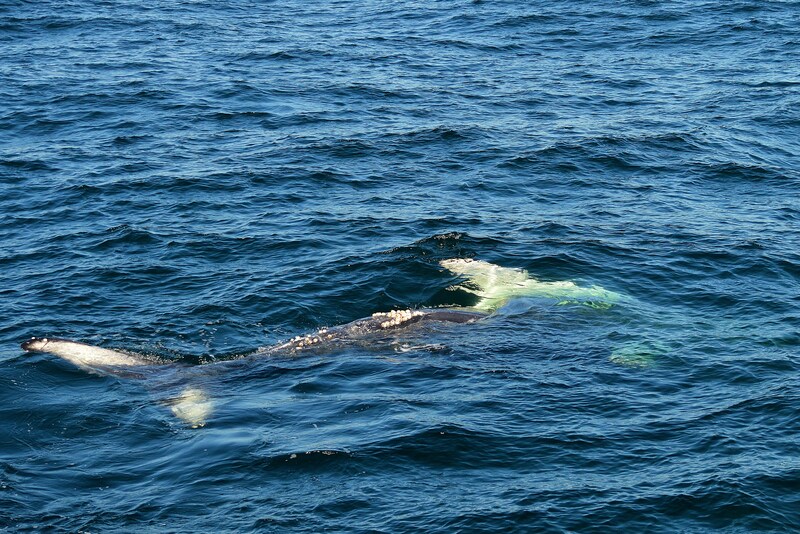 It wasn’t long before both whales moved in close and spent time just under the surface next to the boat. From there we were treated to extremely close looks, some flipper slapping a few yards away, and multiple spy hops from both mom and baby. The spy hops especially are a behavior that we don’t get to experience often, and it is so amazing to watch these wild animals choose to come in for a closer look at us. We spent a full half hour watching these two whales watching us, and then they began to swim a bit farther away. 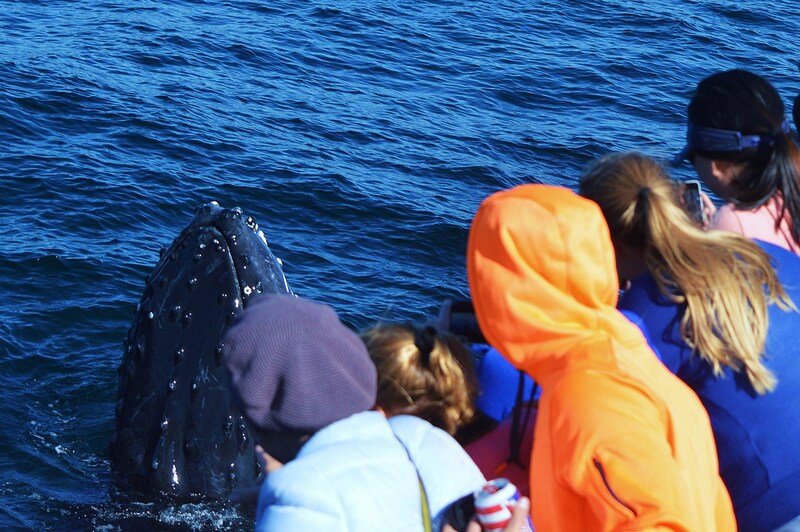 We had heard reports of other humpbacks in the area, so we traveled on to see what else we could find. We watched another mom and calf pair- easily recognizable as Nile and her calf, and were treated again to close looks at these two! From here, we could also see a few other whales about a mile away- it’s great to know they are sticking around for a bit longer before migrating south. Sometimes young whales like to lay belly up beneath the water! I sometimes get the question if the calves we see have their own names. The general rule is that for the first few years of a calf’s life it is referred to by its mother’s name and year of birth (for example Nile 2014 calf and Milkweed 2014 calf). 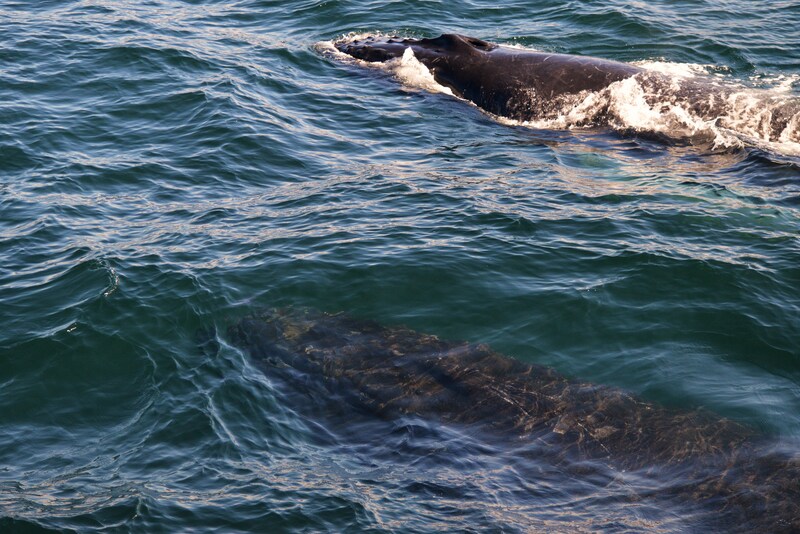 If these whales are to return and are spotted again, they will then be named using the guidelines of naming the whale after a mark on the whale’s fluke. We have had some very, very special trips with Milkweed and her calf this year, and today was another to add to the list!